Less than half of all Canadians over the age of 65 are meeting the daily recommended intake of at least five servings of fruits and vegetables. Now, a new study conducted by researchers at the University of British Columbia, aims to explain why. Study researchers explored what types of social support encouraged seniors to increase their daily consumption of fruits and vegetables. The survey analyzed data from 14,221 Canadian adults over the age of 65. 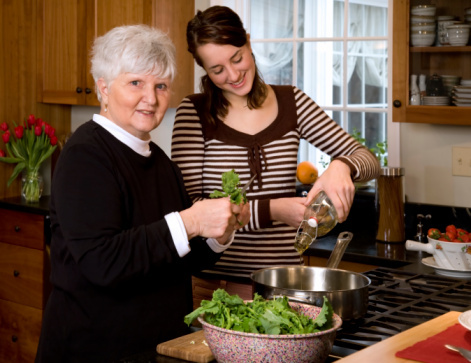 Social support was divided into two categories: tangible support, which focused on physically assisting individuals with tasks, such as shopping and cooking; and emotional and informational support, which included building confidence by allowing individuals to perform tasks, while providing minimal advice, such as recipe ideas and meal suggestions. Researchers discovered that social support did not play a significant role among men. Alternatively, women reached their adequate intake when provided with emotional and informational support, but tangible support was detrimental to their intake. “This may mean that emotional support is encouraging women to cook for themselves, and that the meals they prepare contain more fruits and veggies than those made for them,” stated the study’s lead author, Emily Rugel. According to researchers, educational campaigns among the elderly population should stress the importance of incorporating more fruits and vegetables into their cooking and overall diet—providing more affordable access to produce. Rugel, E.J., et al., “Gender differences in the roles for social support in ensuring adequate fruit and vegetable consumption among older adult Canadians,” Appetite 2015; 92(2015): 102–109. University of British Columbia, “Gender differences play key role in supporting healthy diets for seniors,” ScienceDaily web site, July 9, 2015; www.sciencedaily.com/releases/2015/07/150709092735.htm.